- Pets provide unconditional love. They do not pass judgement and will provide support and comfort to a child without consequence. - Pets may encourage emotional management and empathy within the child. A child can confidently rely on his/her pet to love them no matter what and they also want to care for that pet in return. - They will start to observe what their pet needs such as food water or even cuddles when the pet is afraid of something. - A child may build confidence and responsibility if they have a pet that they must care for. The importance of another life as their responsibility really builds confidence and a feeling of importance. - A pet may increase social and verbal skills within the child for the simple fact that it is a living thing that the child can practice talking to and playing with. - Pets can be incredibly therapeutic for children and adults. Pets have been known to reduce stress and anxiety, increase healing time, and even lower blood pressure. The Autism Speaks website has a lot of information about how pets can soothe a child with autism and help him/her develop a set of skills. They refer mostly to dogs, cats, and horses. Of course the American Kennel Club had plenty to say about the benefits of having a pet, especially dogs, in a family. The article can be found here: http://www.akc.org/content/entertainment/articles/kids-benefit-from-having-a-dog/. The article is based on several research studies. Some of their biggest points are similar to those from the article above; better confidence, more compassion, feeling love and support, better verbal skills, less stress, more happy, and even physically healthier. 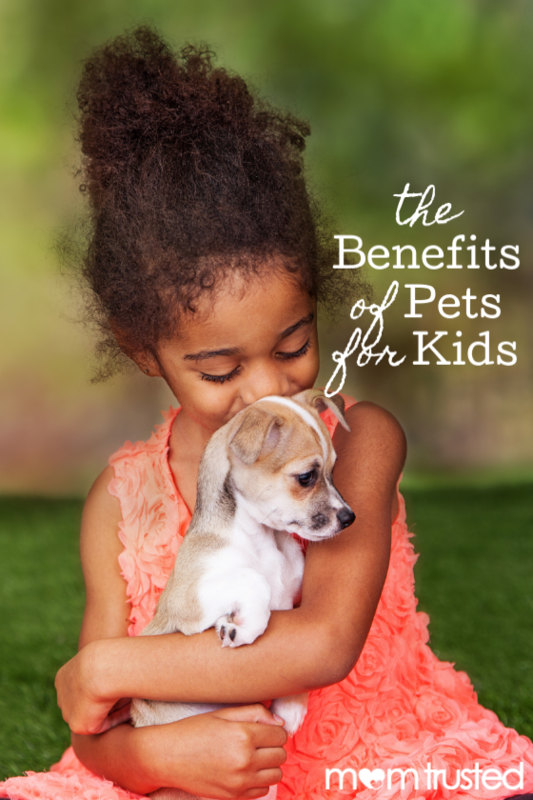 Children who have pets typically spend more time being active and outdoors running around. They also are less likely to develop allergies and could potentially be affected in a probiotic way from their pet. Of course the choice of a pet is very important for a family. Before finding the right fit, a family should discuss space, schedules, and caretaking. The pet should be happy and healthy and should also meet the needs of the family members. Overall it seems that pets are good for families and children, now it is just a matter of which pet is right for you!